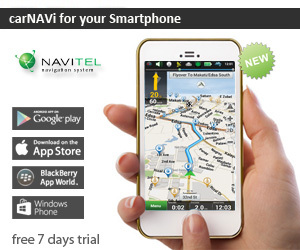 The top of the line, ultra slim, portable and fully featured with the latest power saving SiRF DUAL CORE GPS/Galileo processor, large 5-inch TFT touch screen, bluetooth handsfree and multimedia functions with integrated analog TV, carNAVi Pro TV is a multipurpose navigation guide for your mobile life. carNAVi leads your way with voice guided turn-by-turn directions to get you there on time and keep you safe on the road. 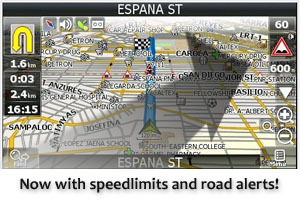 Preloaded with carNAVi’s new HD MapsTM – high detailed quality roadmaps covering the whole Philippines including many thousand points of interest (POI) with perfected routing and address search, detailed maps of Malaysia and Singapore including a worldwide map of major roads and highways, it’s compact, versatile and easy to use. Additional detailed maps* of Cambodia, Indonesia, Vietnam, Taiwan, Hong Kong, Thailand and many other countries in Asia are available in the carNAVi Store online free of charge. With a 5-inch non glare widescreen display, you’ll always get the big picture. View more map details, driving directions and photos in bright, brilliant color. carNAVi has an ultra slim design (only 12.5mm) to fit comfortably in your pocket. Outside your car its rechargeable lithium-polymer battery makes it convenient for mobile navigation on foot with up to 4 hours’ usage between charges. 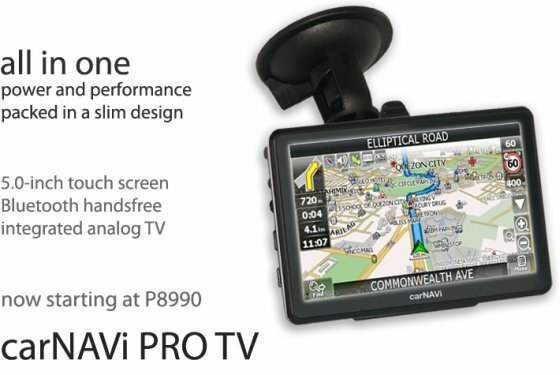 The first navigation system in the market, that not only can play MP3 and video files, carNAVi PRO TV has an integrated analog TV, so you can watch your famous series or news while on the go. carNAVi Pro TV has a Bluetooth Handsfree Kit, your mobile phone can stay in your pocket and you manage your calls just with a fingertip. and Mac OS X 10.4 or later.